I’m tired of hunting for school books around my house, having food expire in the back of my pantry, paying library fines, and lots of other things caused by a lack of organization and systems in my house. A while back I spent an entire year getting totally organized. I went through every nook and cranny, room, bin, and basket in an attempt to declutter and maximize space. You can find out what I did during my organized in 365 journey below. I’ve always been an organized person, but as our family has grown my ability to bring my children along side me and teach them to work within our household system has been severely lacking. One day I got tired of the stuff. Tired of the mess, tired of the clutter. I searched the internet for the best systems and tools to get my home in order. I found a ton of great ideas (many of which I share here) however, the best thing I learned wasn’t a container or system. It was simply to live with less. My best friends became the garbage can, recycle bin and the box marked to donate. Staying organized is so much easier, when you have less to keep organized. Remember that as you go through your home and declutter. How to keep up with daily cleaning. I’m guessing you have too much of it. I know I do. Find 5 things in your home, car, purse, pockets, backyard, etc… that you can toss. It will take you less than 5 minutes. Promise. I’ve seen it a few times and it makes me very sad. What I realized while watching it was that these homes didn’t get completely disorganized overnight. At some point in the person’s life they probably lived in a place that you could walk through without risking injury. However something changed and over time the amount of stuff in their home grew to an unmanageable amount. It wasn’t as if all of a sudden a dump truck pulled up to the back of their home and dropped off fourteen tons of junk. Slowly over the years they collected mountains of things they didn’t need, but couldn’t let go. Then at some point they became overwhelmed with the amount of stuff in their house and now cannot even begin to start reclaiming their lives from the mess. 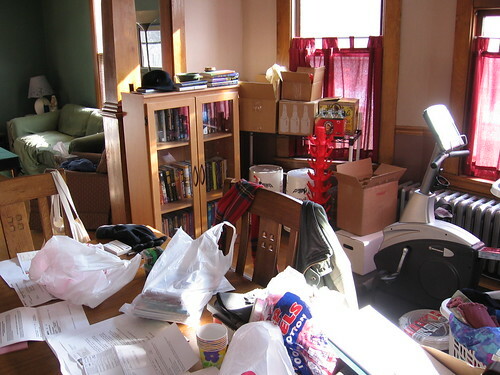 We all have areas of disorganization in our lives that are caused from a mild case of hoarding. It might not be to the degree we see on the show, but there are probably overwhelming areas of your life that you can’t seem to even begin to fix. Here’s something to think about if you are overwhelmed in your quest for organizing your life. It didn’t get that way overnight, so don’t try and fix it overnight. Tackle a small space that is overwhelming you. Set the timer and commit to spending fifteen minutes working on a problem area. It only takes fifteen minutes. Don’t answer the phone, check your email, Facebook, or Twitter. Just work on one project for fifteen minutes. I think you will be surprised at how much you can accomplish. If you just can’t get started ask a friend to help you. A few years ago I was totally overwhelmed with my sewing area. A friend came over and one night we worked together to get it organized. It was much more fun to work with my friend and she encouraged me when I wanted to give up! Oh and actually get rid of it. Don’t put it in a pile for later, or you’ll just have more stuff tomorrow. If you can do this every day for one month you’ll have tossed over 150 items! Think of how much progress you can make in 5 minutes a day! When organizing spaces in your home it is important to handle it once and make a decision. (Try the touch it once technique) I often find myself stacking items in piles not wanting to make a decision on what to do with them right away. This does not work for me. I’ve found “I don’t know” boxes during moves that haven’t been opened in two or three years! Obviously I didn’t really need those items because I lived for years without them! I’m not talking about keepsakes or hand-me-down clothes, just stuff! When organizing grab a few boxes or bags and label them give, donate, sell, and toss. If you aren’t going to keep an item put it in the labeled container immediately. I usually take a bag of items to church every Sunday with my give items. My donate items go straight to the car and I drop them off at our local Goodwill next time I’m out. If it’s something worth selling I’ll usually list it on Craig’s List that evening (or wait until the weekend) and the stuff that isn’t worth selling, donating, or giving away is thrown out or recycled right away. I find that the satisfaction of getting the items out of my house quickly motivates me to keep organizing. If I just stack and pile I often find myself discouraged and end up with a bunch of half finished organizing projects. There is a site called freecycle.org where according to your zip code, you can give away things you no longer use that would otherwise be thrown away or sit in a box until you had a yard sale or donated it. You join, post an ad, and choose who you would like to give it to. There are so many ways to get rid of unwanted stuff, there’s no excuse for keeping it in your home. I love this homemade tower for handling piles. Personally I’d use plastic bins because I don’t think the cardboard ones hold up as well, but you can find the tutorial for this project on The Red Chair Blog. After being a military spouse for 22 years and moving countless times I’ve adopted a “live every day like you are moving” philosophy about stuff. Once when getting read to move I cleaned out my desk that I realized hadn’t looked in many of the drawers since the previous move. Most of the stuff went into the trash. I started thinking… why do I only do this when I am moving, why do I hold on to things only to throw them away 6, 12 or 18 months later? One of the reasons I save items is because I am thrifty. I like to save things just in case I can reuse them for something else. I hate to fill the garbage with items that someone can use! Sometimes savings things causes me to spend more money. I have so much stuff in drawers and in my garage that I can’t find what I really need and buy things I already own. Now, I only keep what I’m sure I will use again. Having less stuff is so freeing! Not only is my house not filled with clutter, my mind isn’t filled with mental clutter (trying to remember where I put something) either! Need more help? Here are seven things you can do with clutter to organize your home. Keep your linen closet organized by folding sheet sets together. Fold the fitted sheet and pillow cases inside the flat sheet. Label your shelves by bedding sizes to keep your linens extra organized. In the bathroom get creative if you need to store multiple towels. Use a wine rack as a towel rack in a small bathroom. In a kid’s bathroom, use a coat rack to hang towels the kids are using. You can hang more towels with hooks than a traditional towel bar. 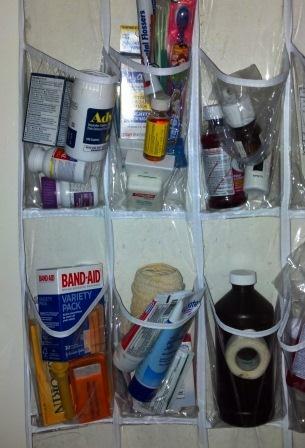 An over-the-door shoe organizer is great for storing first aid items in a small bathroom. Keep in mind that young kids would be able to reach the lower pockets. 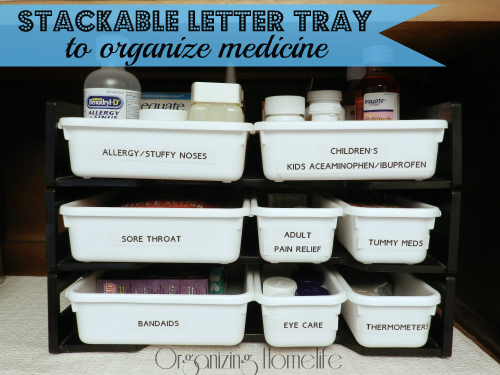 A stackable letter tray works well for medicine if you have space in a linen closet. With four girls we have no shortage of hair accessories. Oh wait, we do! This is because pins, bands, and ribbons get lost around here. This upcycled hair station is so cute and can be made with items you already have around your house. Get the tutorial here. 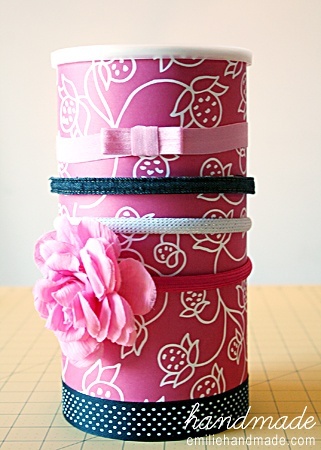 This cute headband holder is made from an oatmeal container. 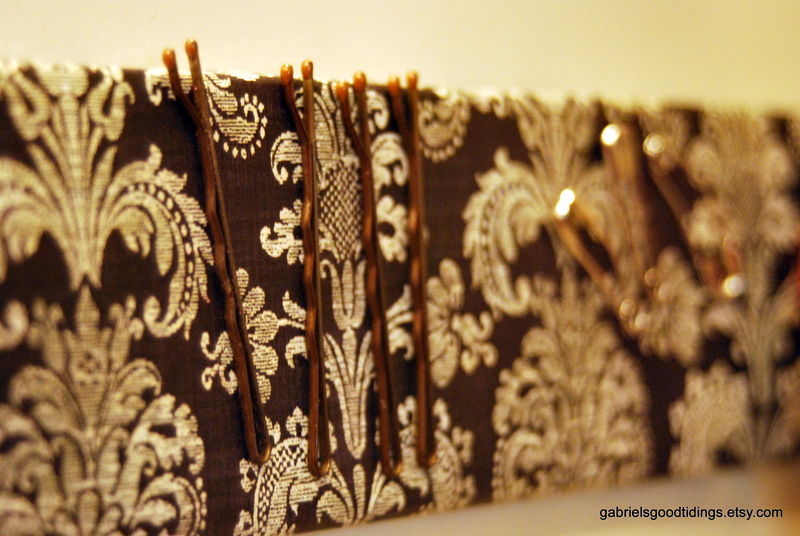 Amy shares a great way to organize bobby pins or safety pins and discreetly hide them in the bathroom at Gabriel’s Good Tidings. 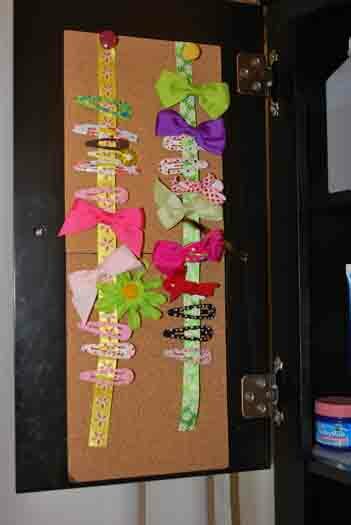 This is a cheap and cute way to store your little girl’s hair bows! Take the hanger and hang it from a nail in the wall. 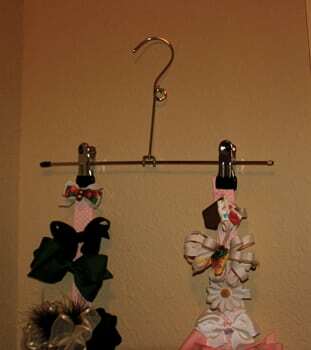 Hang a ribbon from each clip. 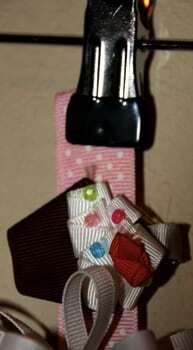 Attach the hair bows to the ribbon. This is so cute and can be hung in a bathroom, closet, or even in the bedroom as decoration! 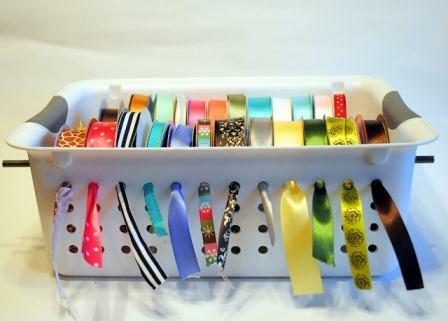 Organize hair clips, ribbons, and headbands with items you already own: repurposed cardboard tubes, a clean aluminum can, cork board, ribbon, and push pins. Cost: $0. Time: 15 minutes tops. Problem: Solved. Visit Simple Life and Home to see how it’s done. 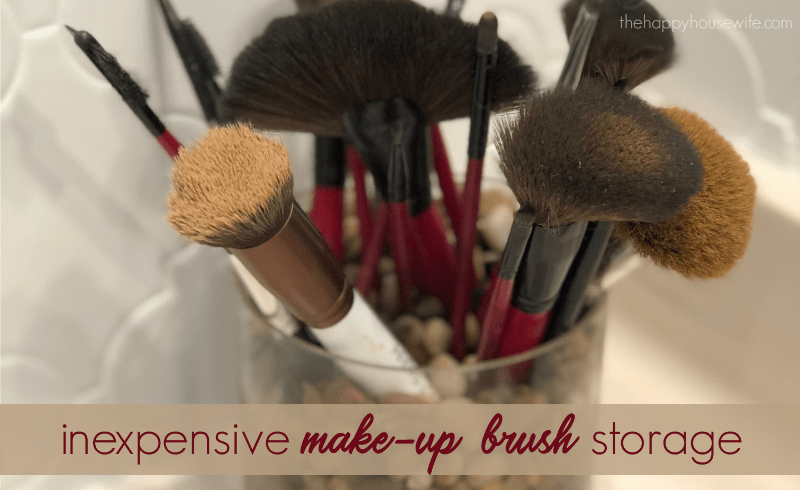 Keep make-up brushes within reach with this storage method. 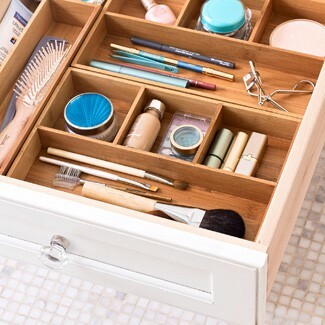 I love this idea for repurposing a silverware tray to hold cosmetic items! 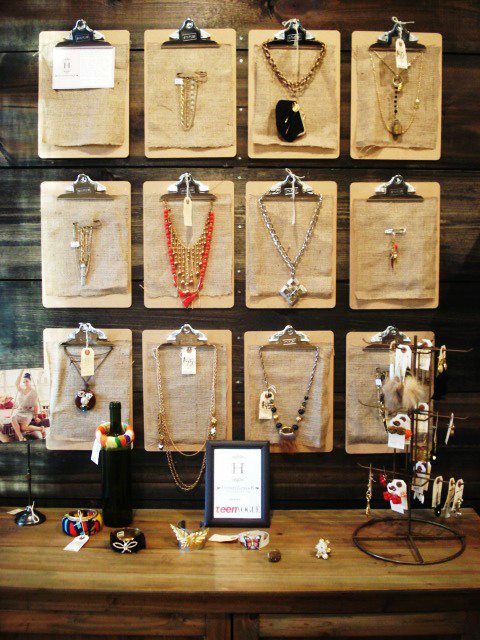 Looking for a creative way to store jewelry? Tired of tangled chains? Then, forget the jewelry box! Whether you’re storing heirlooms or a five-dollar find, BrightNestv has five creative jewelry organization ideas that will keep your gold chains untangled and your pearl studs in one place. I love to take photos of my kids. So much so that I have amassed thousands of photos over the past 24 years. Read how I (try) to organize my digital and print photos. Digital photos have taken over my life, or at least my computer. I have over 40,000 pictures on my computer and my computer barely works because of all the images. 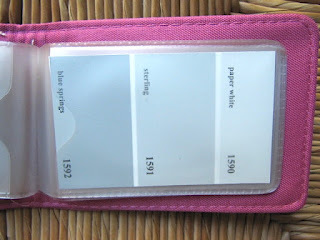 I love this idea from The Crafting Chicks to organize and store your digital photos. Store batteries all facing up the same way as in their original wrapping. Batteries start discharging themselves if they come into contact end to top. Did you know that storing your batteries in the freezer so they last longer is an old wive’s tale? Duracell recommends you store batteries at room temperature. 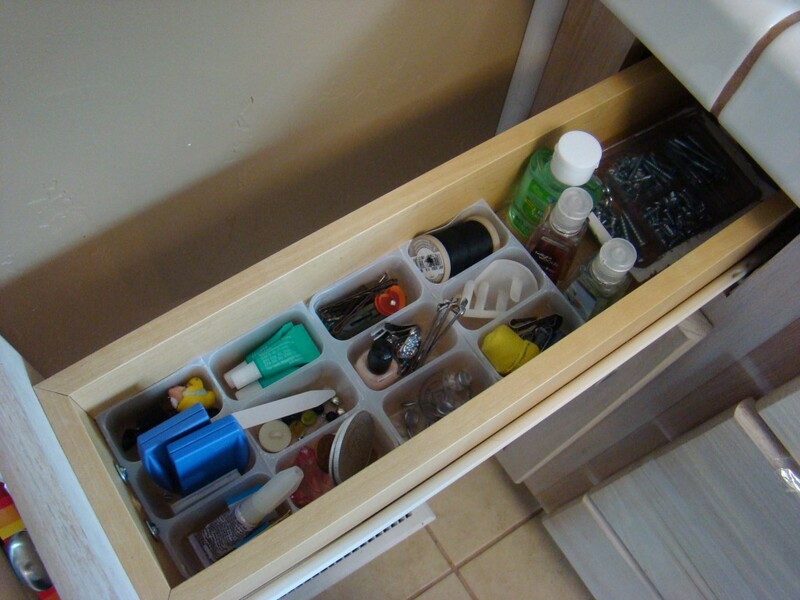 Keep your junk drawers less junky by repurposing packaging to keep the drawer organized. Do you have Altoids tins lying around your house? 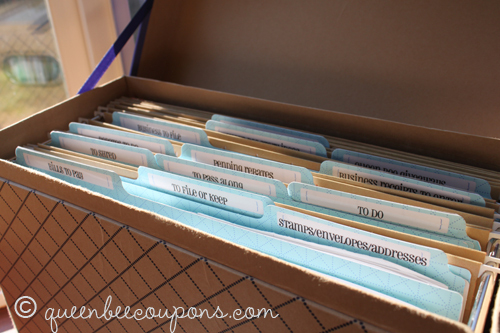 Use them to organize your desk! I found this clever idea on Flickr. 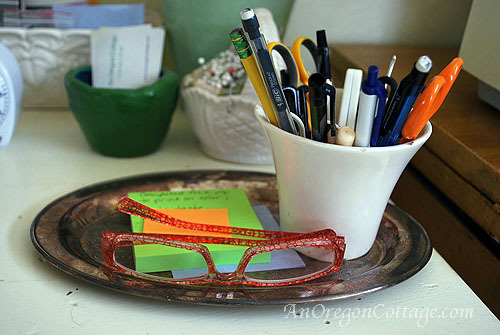 Shop your house, thrift stores and antique stores for one-of-a-kind containers to hold office and craft supplies. Think beyond what the item was originally meant for to “go green” and reuse it to lift everyday items from mundane to inspiring. Check all the amazing repurposing ideas here. 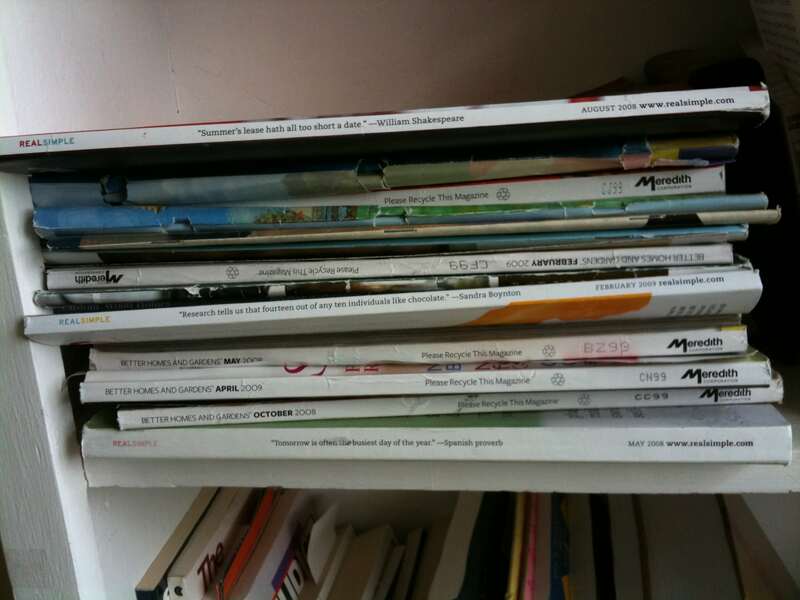 Do you struggle with magazine and/ or newspaper clutter? For many years I hated to throw away any magazine or newspaper. Thankfully I didn’t subscribe to many of either, but I was just sure I would need the magazines for a homeschooling project or a decorating idea, and the newspapers for wrapping packages or Christmas ornaments. I had stacks of magazines everywhere in my home, bookshelves, bathrooms, next to the bed, under the bed, coffee tables, end tables, baskets, bins, etc. Then we moved and all the magazines were packed up in boxes. I didn’t unpack the magazines and some time later we had a flood in our storage area. When I opened the boxes they were filled with soaked and ruined magazines. I threw the boxes away and was sad that many of my favorite magazines were gone forever. 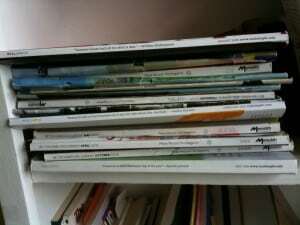 The interesting thing is that while the magazines sat in storage and after I threw them away I never missed them. Not once. This was a great lesson for me, because once I realized those magazines cost me more than I gained, I decided it wasn’t worth it for them to clutter up my home. Does clutter cost you time, peace of mind, or happiness? This weekend identify something that is robbing you of your joy. Throw it out, donate it, or sell it on Craig’s List. You’ll be glad you did. Organize and Decorate Everything also shares tips for Conquering Magazine Clutter. 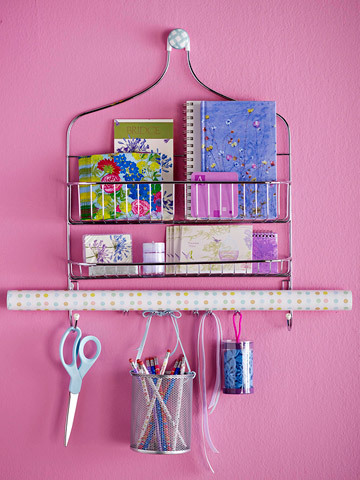 If you are going to keep items, make sure they can be repurposed to help you stay organized. There are so many awesome organizing ideas, there’s not excuse for not being able to repurpose something instead of buying new! Use a shower rack for stationary. Use a dish rack for organizing files. This is a unique way to hide cords and power strip while you charge electronics. Amy shows you how to convert a bread box into a charging station at Gabriel’s Good Tidings. 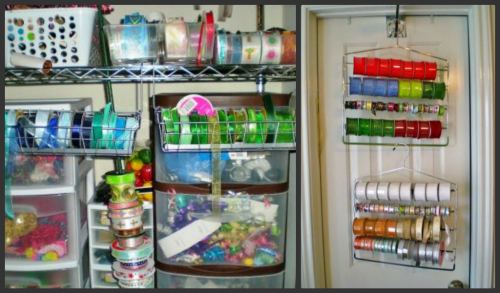 If you use spools of ribbon for sewing, crafts, or gift wrapping, here is a creative and useful way to store them. Get the instructions at Spunky Junky. 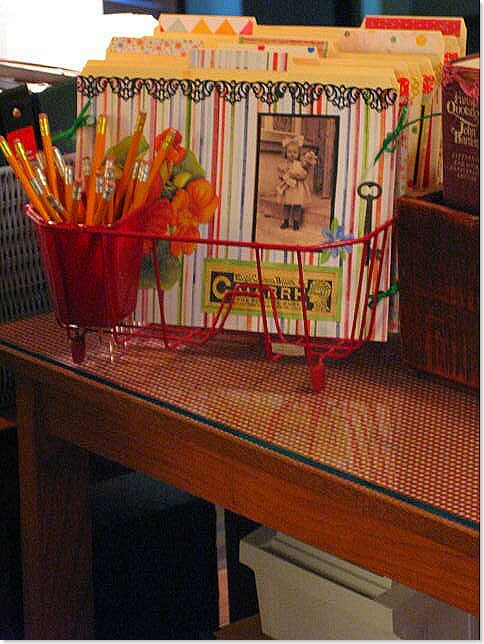 Use wire baskets from Ikea to organize ribbon. Wire shelves and baskets hang easily on the rim on the shelves. They could also be hung on the wall or a peg board. When a roll gets empty, take it out, throw it away and replace with new ribbon. 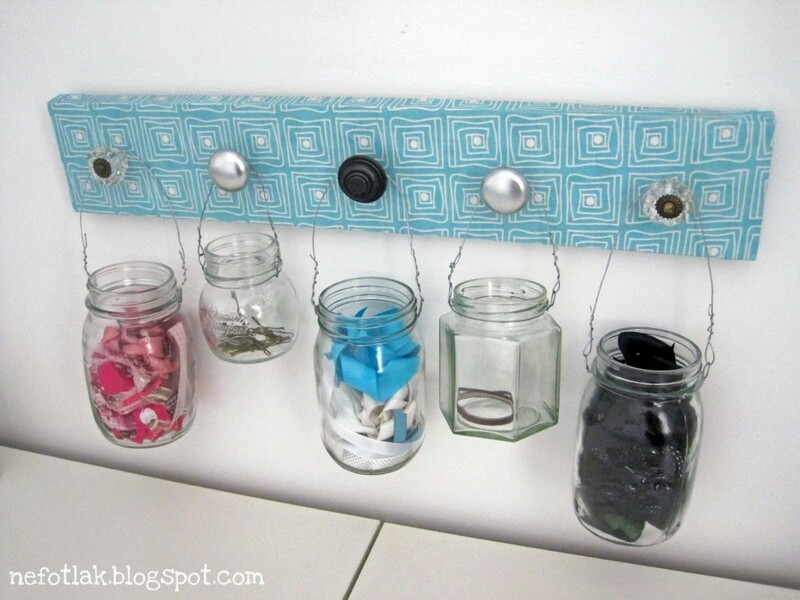 Give an old spice rack new life by using it to store beads, buttons, office supplies, or other small items. The clear containers of the spice rack make it easy to see your items at a glance. Find out more at Blessings Overflowing. 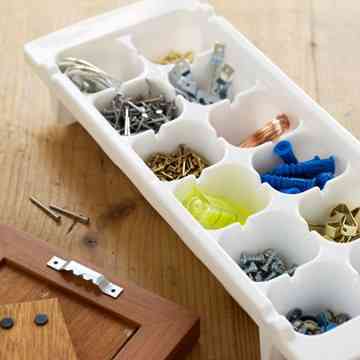 An ice cube tray makes a great storage container/ organizer for nails, screws, and other small hardware. The Greenbacks Gal shares ways you can repurpose egg cartons, including several ways they can be used for organization. Sew Many Ways shares a variety of items that can be stored inside a dollar store business card holder. Before you spend big bucks on containers when you are organizing around your home think about reusing something you already have. It saves you money and it keeps items you might have throw away out of the dump. Before you throw away an old shoebox, you might be able to use it to organize drawers and closets in your home. nail polish – try a Velveeta box! These work great too. cookie sprinkles, food coloring and the like! You can spray paint or cover the boxes in pretty paper, but I just fill them up and add them to a shelf. All is in order. So easy. So affordable! Don’t throw away your diaper boxes. Cover them with pretty contact or wrapping paper and use them for storage. 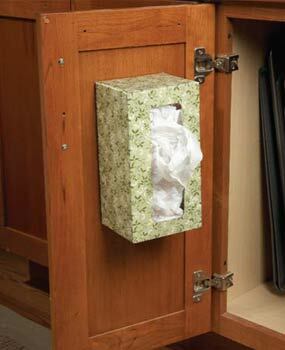 They make great storage containers in laundry and kid’s rooms. This diaper box storage solution works perfect and adds a little personality with the the contact paper to give it a more finished look. 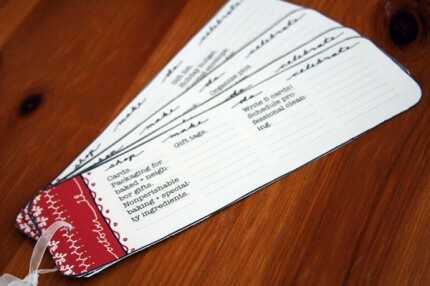 You can even take it a step further and make labels for each box as you see fit. The total cost was just a little bit of time in wrapping and organizing. Over the door shoe bags are one of my favorite organizing hacks. See how it is used to organize a little girl’s room here. 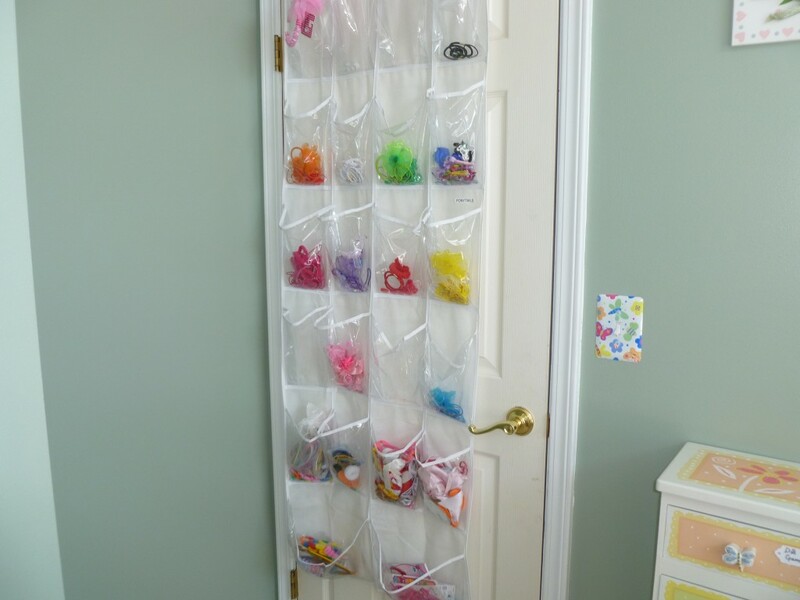 On the back of the bedroom door organize hair accessories by color. On the back of the pantry door organize little things that can get easily lost in a pantry, like Koolaid or tea packets, snacks for the kids, little pudding boxes, straws, etc. On the back of the coat closet that holds hats and gloves. Each member of the family has their own labeled pocket for both. Remember, when using basic household items for storage, they don’t have to look basic. 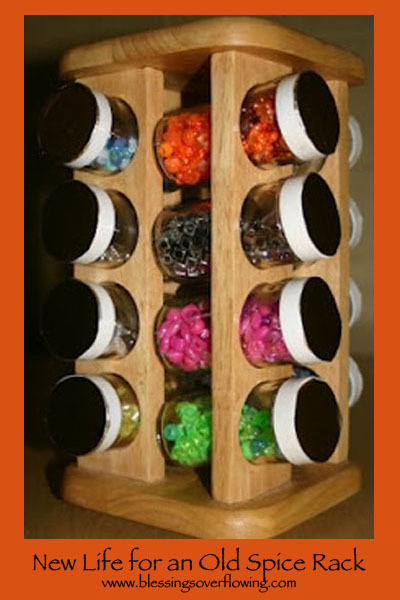 You can make storage containers attractive with a quick trip to the Dollar Store. Do you love to clean? I don’t. However I know it’s part of “adulting” and having a house that I want to live in. One way I stay on top of my daily chores is to commit to cleaning 15 minutes each day. If I spend 15 minutes every morning doing small jobs, I don’t have many big jobs waiting for me on cleaning day. I use this checklist to stay on top of my daily chores. Remember, everyone has the same 24 hours in every day, and seven days in their week. As much as my mind sometimes seems to think “later” will be less hectic than now, it never turns out that way. So, what does a busy mom who wants a clean home do? You have two choices. Read more on how to fit cleaning into your daily schedule. Here are some of our best tips for cleaning items in your home. Maybe you’ve let projects go for a while and need a big cleaning overhaul before you can start a regular cleaning schedule. If you have a lot of big cleaning and organizing projects around the house but can’t seem to find the time to get to them, commit to another 15 minutes each day to work on them. Several years ago I committed to spending 15 minutes a day tackling big projects. While 15 minutes might not seem like a lot of time, if you do it every day it adds up! What could you get done in 7 hours? I often think of cleaning as as way to make money! I know that seems silly, but here’s how it works. Also, I end up with boxes of items to sell and donate. Here are a few ways you can get rid of your unwanted items and make a few extra dollars. You can also donate these items to a local thrift store or charity. Just don’t forget to get a receipt. You can deduct thrift store donations so talk to your accountant for more information. I can’t remember a time in my parenting life when I wasn’t trying to organize my kids’ toys. 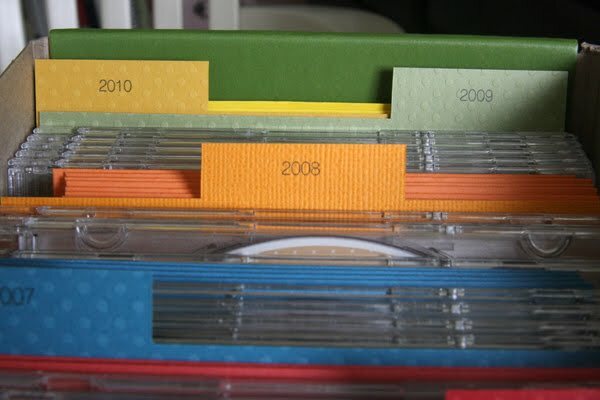 After 24 years of trying, I’ve decided that different spaces and seasons call for different organizing techniques. My favorite space was the basement because at least I didn’t have to see the giant toy mess all the time. However the basement was also the place where toys got lost and were found months or years later only to end up in the donate bag. In fact, once I found an old back pack with an almost finished half gallon of ice cream inside it hiding in a toy box in our basement. Here are some of my go-to organizing tips for toys. I usually throw away the packaging and store toys in bins, totes, and baskets. 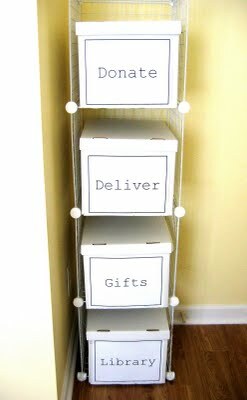 Bins and totes stack nicely in the closet and baskets give the look that the toys are organized, even when they aren’t! 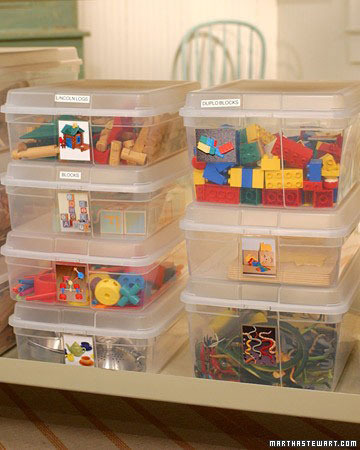 Use clear bins so the kids know what toys are in each bin and you aren’t stuck pulling bin after bin down so the children can see what’s inside. If you don’t have clear bins you can always take a picture of the toys and tape it to the outside of a solid bin. This also helps with clean up if mom isn’t around to show everyone where the toys belong. I try to get rid of toys my kids don’t play with, but even then we still have too many toys. Consider packing away half of your child’s toys. In a month switch out the packed toys with the toys that were not packed away. Your child will have a fresh supply of toys every month! If your child wants a new toy ask them to pick one toy to get rid of first. This will help keep toy clutter more manageable. I store toys where my kids play with them. The toy kitchen is usually located close to my kitchen. Puzzles are stored in the hutch next to the dining room table. Play-do is stored at the top of the pantry. This makes finding the toys and putting them away easier. As I mentioned last week, most kids have too many toys so don’t be afraid to get rid of some of them. If you aren’t sure what toys to get rid of have your child help you, or pack up several boxes and store for a few months. If your child doesn’t notice they are gone you can probably safely deliver them to Goodwill. Light sabers and nerf guns don’t fit into traditional organizational containers. 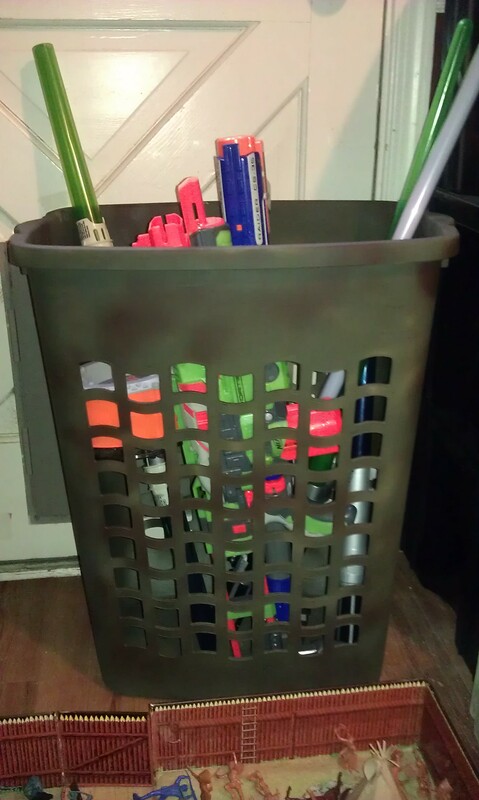 Holly repurposed an old plastic laundry hamper by spray painting it with a coat of primer, then spray painting it with green and brown paint to look like camouflage. Any color will do to match the style and interests of the child. It’s sturdy enough to hold the larger toys and keeps them off the floor. 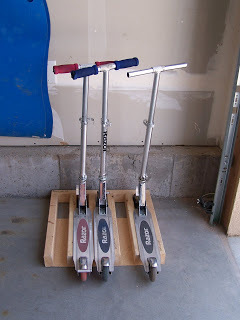 This homemade scooter stand keeps scooters neatly organized. Find out how to make it at Batchelors Way. I love these wire baskets to store balls. 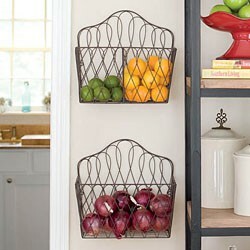 These wire baskets are Crate & Kids, but I’m pretty sure you could find a less expensive version at Target. And really, who has their own bowling pin set in their garage???? 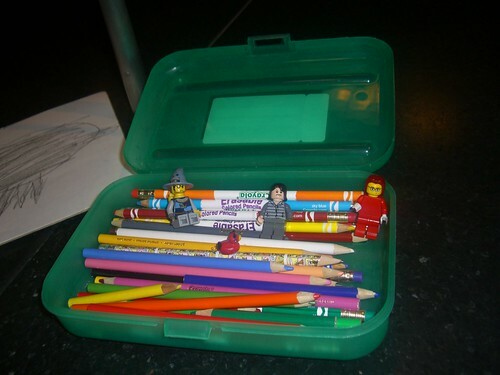 If you have a number of Lego sets in your house, and your children like to sometimes use the original instructions, here’s a great way to keep them organized a My 4 Boys. When organizing toys or anything else, it’s always helpful when you can quickly identify what is in a particular container. Labels serve that purpose, but so do see through containers. 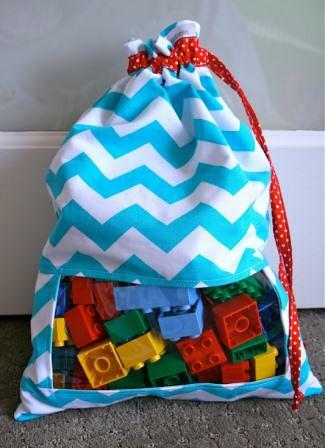 Make it Perfect has peek-a-boo toy sack tutorial that is a cute way to store toys and be able to see what’s inside the sack. 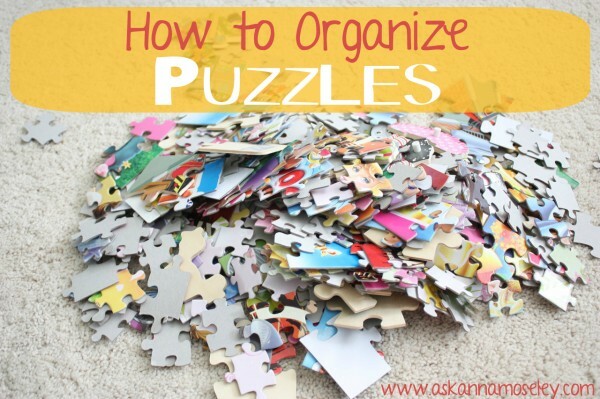 If your children have a lot of puzzles, you might be interested in how one mom decided to organize kids puzzles at Ask Anna. 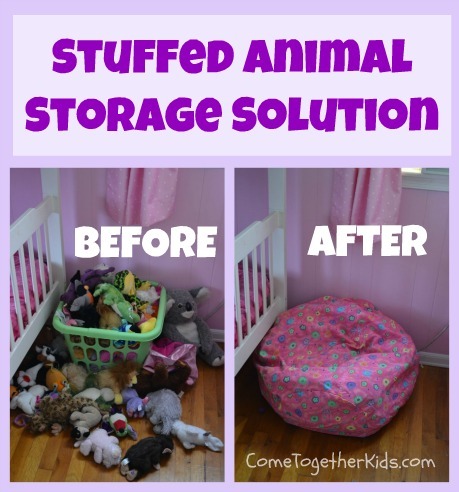 Here’s a way to store that pile of stuffed animals, keep the dust off of them, and make them useful. Check it out at Come Together Kids. If you children love to play dress-up (like mine do!) 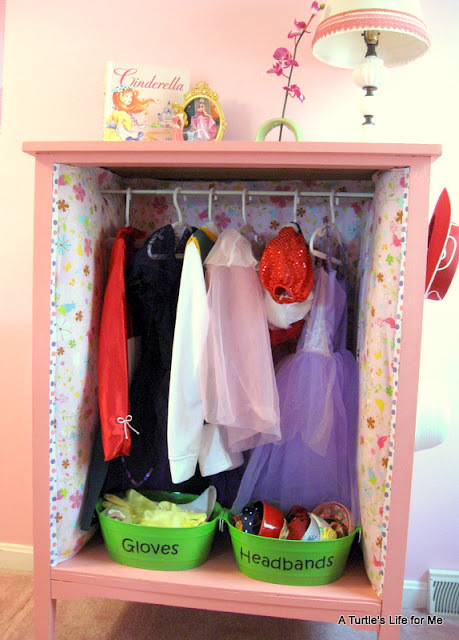 this repurposed dresser is a great way to organize costumes. My comprehensive article on organizing toys can be found here. Get your bills delivered by email! An easy way to reduce on mail, postage, and clutter is to have your bills delivered electronically. In order to stay organized, create a folder for “bills” in your email inbox. Some email programs allow you to filter emails before they even show up in your inbox to simplify things even further. Next time you receive a bill, check to see if that company offers online delivery. Most utilities, credit cards, insurance, cable and phone service have this option available. It will cut down on your mail (and waste) and keep all your bills organized and in one place! If electronic billing doesn’t doesn’t work for you, Heather has an idea for organizing paper bills and keeping your counters clutter free! If your finances need an organizational makeover here are a few free (and not free) resources for you. Did you know that Google has several free budget templates. 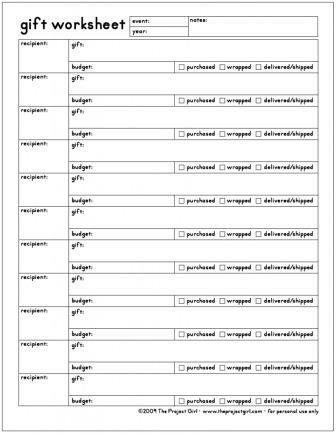 There are family, personal, and household budget worksheets. What I like about Google Docs is that you can share them between members of your family so everyone is kept up to date on the budget. We used Dave’s budget worksheets when we were first starting to put our budgets on paper. He now has an online budget tool available too. This is a link to over ten different budget spreadsheets. There is sure to be one that works for you! Based off the “Envelopes” method of budgeting, Mvelopes is another online program. I actually tried this one for a few months, but it wasn’t compatible with my bank so I stopped using it. Quicken has been around forever and is probably the most popular money management software. Disorganized finances can be costly. Lost bills, forgotten payments, and late fees can wreck a budget! One way to keep on top of the finances is to have weekly budget meetings. For years my husband and I had monthly budget meetings but I realized that monthly wasn’t often enough. If there were glaring problems with the budget, unexpected bills, or over spending it could take almost a month before it was resolved. To keep your finances organized I recommend weekly budget meetings. They don’t have to be marathon meetings, simply 15 to 20 minutes once a week to make sure everything is on track financially. One thing that is important to remember when budgeting is knowing the difference between needs and wants. Living a Frugal Life has a budgeting template to help you figure it out. 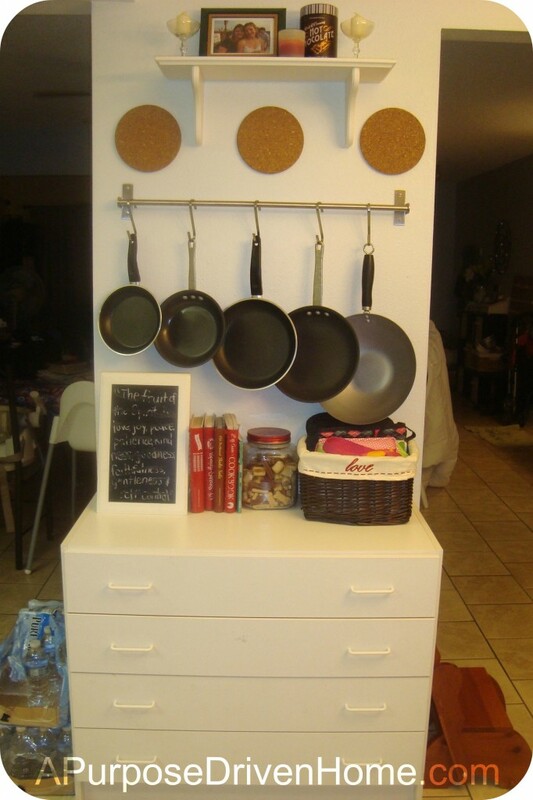 Recycle a dresser to create a kitchen hutch. 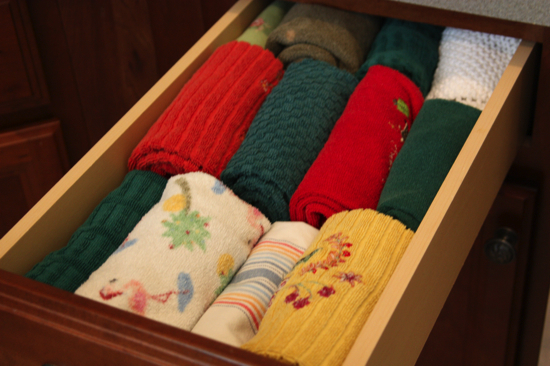 If you use kitchen towels you may find that they don’t fit in those small kitchen drawers. Years ago we started rolling the towels to fit more in each drawer. I can fit twice as many rolled towels as I can folded towels. Mount magazine holders on the wall or inside of a door to hold produce. I usually line my bathroom trashcans with plastic grocery bags. This is a clever idea fromFamily Handyman for storing them that takes up very little space! If you use Folgers coffee or can get a hold of some empty Folgers coffee cans, they are useful for storing all kinds of things. Robin at Heart of Wisdom has an assortment of free printable labels to fit those cans, making it easy to see what’s inside. Having a clean and organized refrigerator and freezer is an excellent way to save money. You’ll know what food is available, and eat it before it goes bad and you have to throw it away. 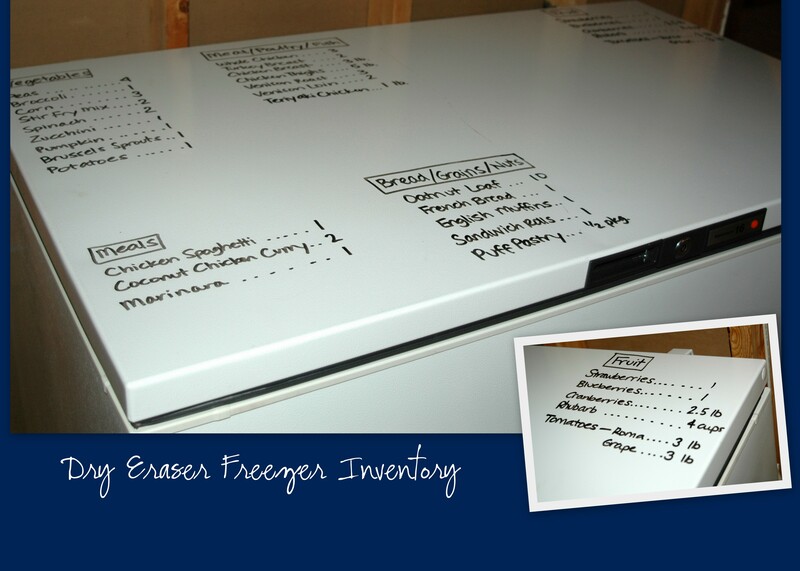 If you have a freezer in the garage or basement, you can create a freezer inventory list on the outside using a dry erase marker. Update the inventory by wiping off the marker with a damp rag. 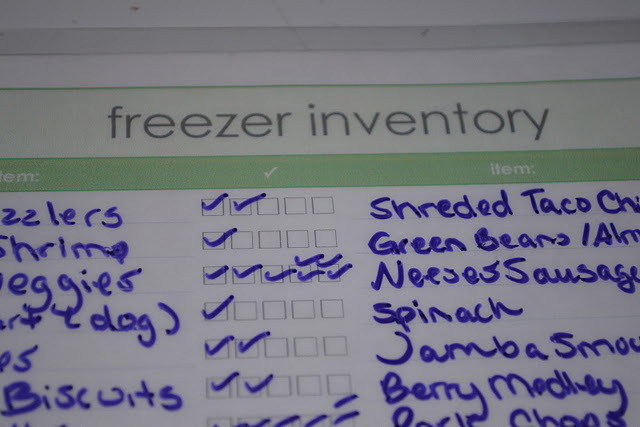 If you don’t want to write on your freezer you can uses a freezer inventory checklist. Laminate it so you can reuse it over and over. 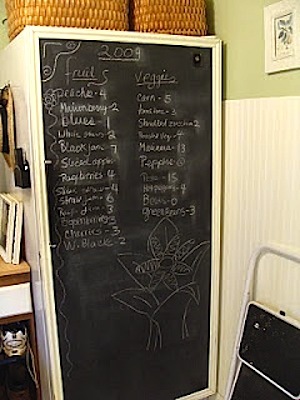 A chalkboard is another fun and decorative way to keep track of what’s in the freezer. 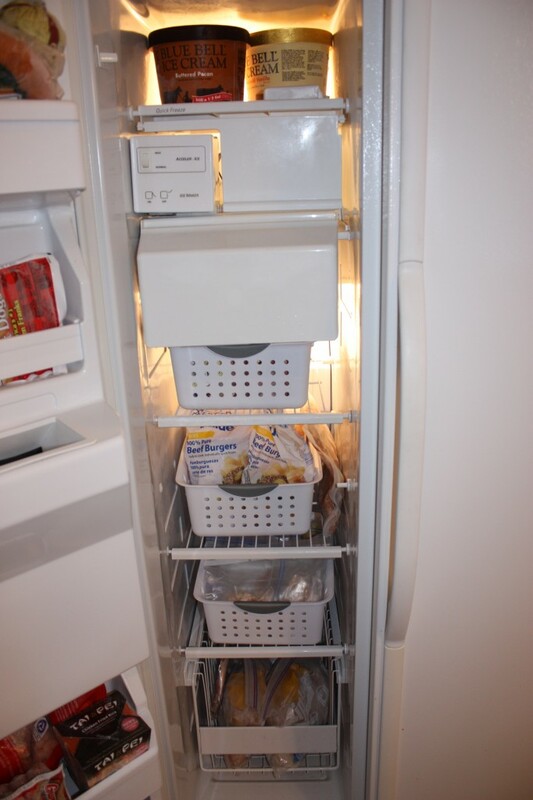 To keep items from getting smushed in the freezer before they are totally frozen try using metal locker shelves. Inexpensive plastic bins are another great way to keep a freezer organized. 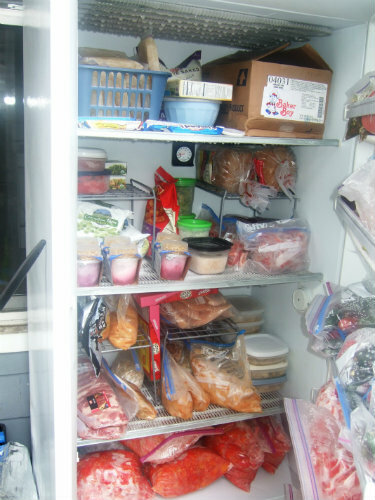 Find out how to organize your side by side freezer on Are We There Yet. 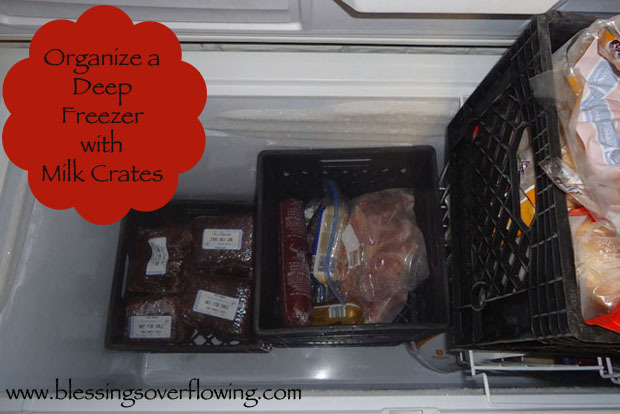 Milk crates are another simple and cheap way to organize a deep freeze. Remember having an organized fridge and freezer is the first step in being a good steward of the food you buy. How you store food in the fridge also matters. Check out this handy chart that will help you use produce before it rots. Have you noticed that stuff has a way of relocating to the car. One way to keep the garbage out of the car is to have a “grab your stuff’ rule. Before everyone jumps out of the car and into the house they have to grab all their stuff. If you are sick of finding cups, juice boxes or the missing glove in the car this will help. At least when you’re rushing off to the next activity you are getting into a clean car! If you have a minivan or SUV is it possible to keep the trunk clean! 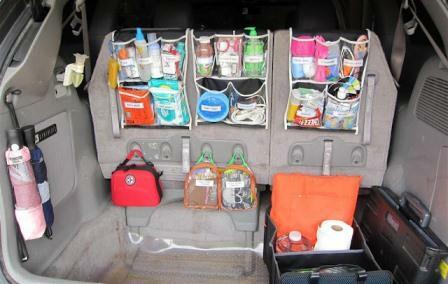 Check out this organized trunk from Junk in the Trunk. Do you have a problem with coats all over your minivan? Madame Deals created a closet to hang them in the back of her mini van. 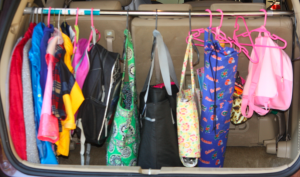 If you live up north check out this tip to hang coats in your trunk from Madame Deals. If you would like to park your clean car into a clean garage, you need space. In our house, the garage is a catch-all for everything that is too big to cram into the laundry room. Cleaning out the garage can be a huge task. 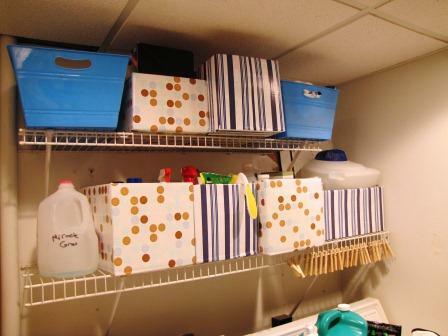 Find a few ideas for creating and organizing zones at Kosher on a Budget. 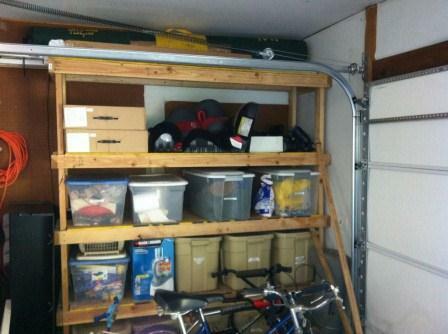 Kosher on a Budget shares here best tips for organizing the garage in zones. 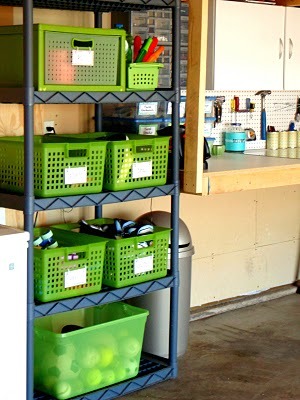 If your garage is full of toys plastic bins are a great kid friendly way to organize. 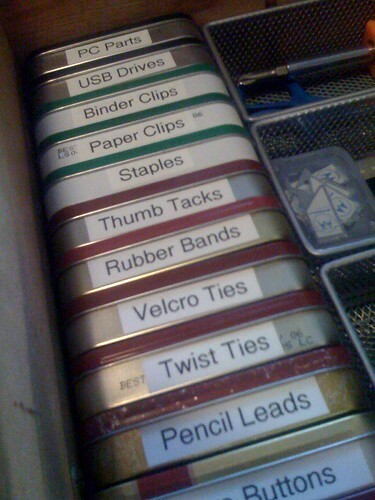 Jen at I Heart Organizing uses labeled bins to organize kids’ outdoor toys. Read her post to find out where she purchased the bins and how she made the labels. 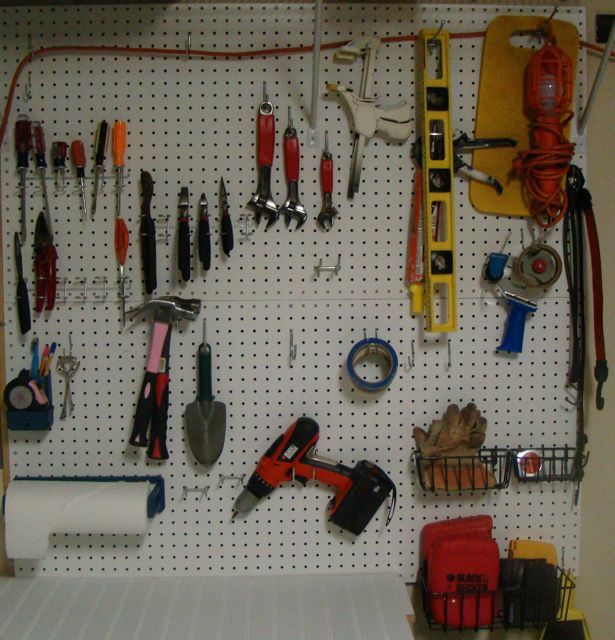 Karen at Saving the Family Money tell you how to easily make a pegboard wall unit for your garage to organize your tools, gloves gardening tools, and more. This free printable worksheet will help keep your gift giving organized and under budget. Download it at The Project Girl. 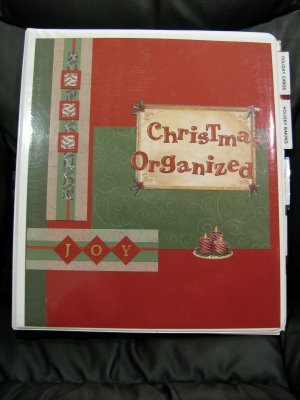 Cards, baking, gifts, parties, and decorating–learn how to keep all the different aspects of Christmas organized in one binder at Controlling My Chaos. This weekly holiday checklist includes the categories Do, Make, and Shop. It’s sure to help keep you organized and focused this month. Find the holiday checklist at Giver’s Log. Under the Sycamore shares a great use for Christmas cards, and it’s not a craft project! I love the concept as it eliminates clutter which is my new favorite thing! 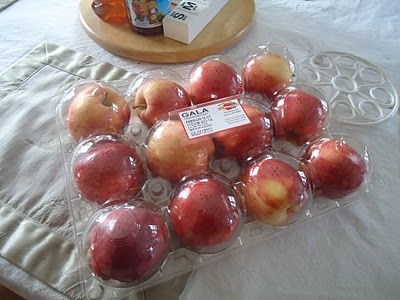 Rather than throwing away (or recycling) fruit packaging, why not use it to store Christmas ornaments. Organizing Made Fun shows you how she used an apple package to store Christmas ball ornaments. Start saving your packaging now! I am so with you. I feel exactly as you do. I’ve lost control of my home and all that is in it and I need to get back on track. I pledge to be more organized in 2012! I share your plight. It’s comforting to know that I’m not alone and support is out here! Good luck everyone! My problem is getting my family on board. My husband is very helpful with cooking and other things. But he is very messy and tends to hoard a lot. My teenage daughter is to much of a argument to get her to do anything.. Please help… I am so overwhelmed that I gave up a long time ago on trying to keep my house the way I like it. And it is so bad that I am ashamed to have any one here or host parties any more..
Would LOVE to join you! Count me in! I am soon with you! What has helped me with homeschool this year was the bucket…Each boy has a work bucket that is filled the night before with all school that must be done the next day. All they need to do is grab the bucket and know what must be done, no more asking me how much more work do I have, they can see it in the bucket, and of course the it colored coded. We have 3 boys who I call The Wisemen. They each have a color….One is Blue, one is Green, the other is Red. As much as possible I buy them things in their colors. ex-folders,buckets,pencil cases,bedding,hoodies,ex…They all know their color and that helps so much with everything else, not just school. Pool toys are even color coded,sunglasses. 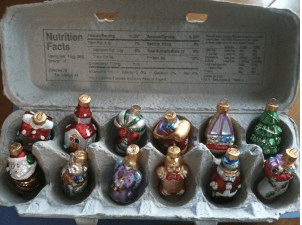 That has helped the wisemen as well,they can see what needs to put away just based on the color of the item…..
We have 4 kids and are color coded, too. My MIL did this with her 3 boys and it’s pretty genius 🙂 They have color coded bath towels, buckets at the door for hats/mittens/etc., chore charts, etc. me too…with a second baby on the way in march, we have to get organized or she may get lost in the junk! ugh! Our second is due very soon, and I am afraid he/she will get lost as well! I’m in! I was just thinking yesterday that it was time to get organized! I’m with you! Sick to death and back of the constant mess, and constant searching for SOMETHING! Count me in, this sounds like something I have been looking for!! I’m in and can’t wait! I am fairly organized, but you can never have too much of a good thing. :-) I love the slogan! I am totally with you! I have been reading all these “this is how you get organized” posts all over the place and thinking, “but they don’t know what it is like to have all this extra STUFF since we homeschoooooooool” [insert whiney voice here]. You totally made me giggle! 😉 Thanks for letting me know I am not the only one who is getting swallowed alive by school stuff! Same here! LOL I am drowning in school stuff! I could have written this post…I am very much in! I’m in!!!!!! Keep the posts coming! I’ll need LOTS of motivation!!! I’m in!! 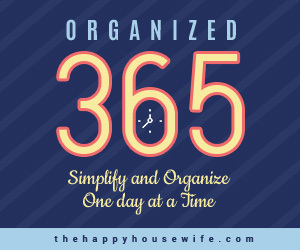 I used to be organized and now with 4 kids, I am unorganized and it’s driving me crazy! I am sooooo in!!! I definitely need to get organized! I’m in, but can’t start until spring. My little boy is having a bone marrow transplant in 2 weeks for leukemia. When he is home and better I’ll need to start. My house is quickly looking like an episode of the hoarders. Hi Sharon, I know this isn’t the point of your comment, but I wanted you to know that I said a prayer for you and your little boy, that his transplant won’t be too hard on him and for his complete recovery. Praying for your little boy Sharon. Also praying for your son, Sharon. Would love to get organized, and I need all the encouragement I can get! 🙂 Count me in! 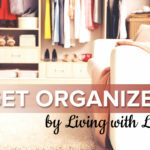 I got some great ideas for organizing my home from FlyLady.net. I recommend it to everybody! Good luck! Count me in! I was so excited to see your post! We began last year working on big projects around the house and made some progress, but there are a lot of spaces that need decluttering. Can’t wait to do it with a support team! I can relate to that. Count me in! I’m with you. This was actually one of my things to do this year. I so need this. After our grown daughter was forced to move back in with us, there is “stuff” everywhere and nothing anywhere! My goal is to re-gain possession of my possessions. LOL Or at least get them in a happy place where they can be found when they’re needed and NOT several days later, while looking for something else. I am with you. Last year was just one of those years. I think I did better during the year my hubby was in Iraq and I ran things by myself. I’m ready to kick it in gear….though an upcoming PCS back to the states may make things a bit more challenging. would LOVE to do this…only kicker is how do you get a husband that likes to keep memories in on it ? I am SOOOOOOOOOOO in with this! With 3 children if I don’t get organized I may lose all 3 of them. I’m in! Can’t wait to see what ideas you have!! I am in, and need it so badly!! Count me in……I need this!!! I’d love to make my way through the excuses & guilt feelings to really accomplish a semblance of organization. A network of support can only help! I spent the day yesterday completely mucking out my almost 13 year old son’s room. We started by moving everything out, cleaning thoroughly and then purchasing those very inexpensive cubbie style square units for new side tables and one for a bench with 3 more cubbies. It offers him 11 new cubbie drawers and 7 open book shelf spaces. After setting those up, we simply moved back only what he wanted, would use and afforded him a clutter free space. We even specified a cubbie for his entire boy scout uniform, so no more looking for pieces and being large looking for uniform parts. He really got into organizing his own space and now has a really nice space of his own! I’m with you. Being newly married with an instant family, I’m already struggling to be organized. I’m totally in! I have a DS6, DS4, DD2…..we r drowning in chaos! I absolutely LOVE this idea! I am not one of those who is naturally organized. I need help! :-). I am definitely in on this! Thank you so much for offering the opportunity to get organized together! I need help organizing all the things I have to organize things with !!! I’m am SO on the same page as you!!! I don’t homeschool, BUT I do work 2 jobs as a single mother and also am the PTO president for my son’s school, his cub scout leader, his tball coach and my house has suffered because of it all!! I need my house to be super organized so that my son can help keep it clean and we don’t get drowned in clutter! I am in too 🙂 I am very excited to get to it! I’m in…in particular I need to get my garage under control. Yes, I’m in!! I’ve been slowly trying to simplify and get organized over the last few months. Can’t wait to see your tips. Thank you in advance! Getting organized is a priority of mine for this year as well. Can’t wait for your tips! Started this process yesterday…with the fridge! 😉 And then it moved onto the family/ school/ daycare room. Now if I could get the other rooms as organized I would be so put together I wouldn’t know what to do with myself…haha! I am with you and can’t wait to get started!! As a household of 3 kids, a homebased public schooler, full time college student disguised as a mother, 2 kids 4 & under, cat & so much more chaos I would be here all day to describe…thank you we need this! I’m in! I “used” to be soooo organized – but somehow it has somehow gone the way of the dodo bird. My goals this year are to be more financially responsible and more family orientated – this will definately fit right in with my goals! I would love to share some of the ideas that I have, as well as things that I have done in the past and are bringing back into my life. I would love for you to share with you and your readers at my blog – my first idea that I’ve brought back from the land of the lost are monthly menu’s. Check it out at http://www.cdm-arewethereyet.blogspot.com. Can’t wait to read about your ideas! Oh my gosh – can you say, “read your post first Carol”? I am so embarrassed! I usually don’t make that many mistakes within a post (“but somehow it has somehow gone the way of the dodo bird” and “I would love for you to share with you and your readers at by blog”). With writing like that NO one should read my blog – REALY!!!! Let me try that again – What I meant to say was I used to be so organized but it has somehow gone the way of the dodo bird. I also wanted to let you know that I would love to share with you and your readers my ideas at my blog and invite you to come over. Now that I have corrected my horrible mistakes you might want to come see that I really do write better than the original comment. (My only excuse might be – I’m trying to get supper on the table at the same time I am typing this – are you buying it???? No, huh – well, I promise – I’ll do better – just come see! This is great! Just what our home needs this year. I want one word for a theme this year but I may have to settle for 2. Organize and Simplify. Both will be BIG helpers for us. I’m organized, too, but always looking for more tips, especially ones the rest of the family will actually use! I’m in. I used too be so with it… then I got married and had kids. Some of the things I’ve done over the years is put school papers in a plastic bin, at the end of each month I kept only certain papers and recycled the rest. 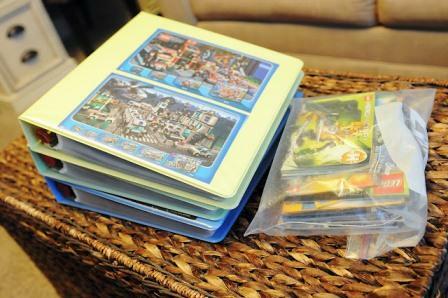 At the end of the year, I go through them again then put each childs in a folder and label. Also, I have a lost and found bin that we put little pieces of legos and whatever I find laying around the house in. The color coding I’ve done since they were babies. Looking forward to getting input from other moms. I’m in…this is just what I need!! hi! i am a little late to join..but better late than never! so i am in too….I am from India, so thins work a bit differently here. out homes, kitchen designs and space utilities are so different but i will utilize your tips to to get things around my home organized, wherever applicable and remodify to suit my humble home. Omg! Are you kidding?! This is amazing! An answer to my prayers! Okay! It’s not New Year’s Eve, but I need to resolve to get more organized. I’m going to give your method a try. It may take me two years, but I’m determined! Thanks for the great ideas. I just found this on pinterest and am psyched to get started too! You nailed my life status right on the head, and I’m excited to enter into 2013 with this plan in my arsenal. Thanks!!!!! Where do I sign up? Second bubba is due in march & I need to start getting this house sorted! This is great! I’m bookmarking this page and I hope to visit it often. Thanks for all the great ideas. Look at the bottom of one of those emails. There should be a link where you can unsubscribe.